If you are just getting started with the Events module, watch this overview video and read Get the Big Picture. Otherwise, just scroll down for FAQ, Common Tasks, and this module's Help Documentation. Events added to your calendar may be enhanced to include photos, sponsor logos and information, website links, and event description text that can be formatted as desired. Options also include online participant registration, special members only pricing, and an automatic email reminder to registered guests. Event information may be kept for internal purposes only, displayed on the public website calendar, and/or a calendar available only to chamber members. The public events website displays a graphical monthly calendar, a list of current events, all events for the month, chamber-designated Featured Events, and the ability to search for desired event by category, keyword, or month. A printable listing is also available that contains all pertinent event details. Invitations may be sent to potential participants and then automatically displayed on the participants list where their status may be changed from Invite Sent to Registered as RSVPs are received. From the participants list a roster sheet, name tags, or labels may be printed. Other output options include sending emails and downloading data to a comma separated value (.csv) file. Using a variety of filter options all output can be displayed by registration status, payment status, or according to self-selected filters. Note: When creating a new event, work with the tabs in order as displayed. For example, after completing the General tab, setup the fees (if applicable) on the Fees tab. The Sponsor tab would be next, the Guest List, and finally the Account tab. You may complete them out-of-order if desired but there is a logical flow if working from left to right. Event fees, designated for members or non-members, may be associated with each event. Individual invoices may be generated from the Events module for those requesting an invoice, and if credit card processing is set up then invoices/payments or sales receipts can be recorded automatically upon successful registration. Understanding the basics of how the Events module is organized will give a foundation for operation. Viewing existing events and learning to display only desired events will also be helpful. Then learn how to create, modify and manage events. To add, edit, and manage the Events, click Events in the left-hand menu where you can select the desired event and desired tab. Within the Events Module there are nine tabs: General, Fees, Sponsors, Advanced, Guest List, Account, Files, and Tasks. Tasks: 'Integration with the Project/Task Manager (Pro edition only) When creating a new event, work with the tabs in order as displayed. For example, after completing the General tab, setup the fees (if applicable) on the Fees tab. The Sponsor tab would be next, the Guest List, and finally the Account tab. You may complete them out-of-order if desired but there is a logical flow if working from left to right. 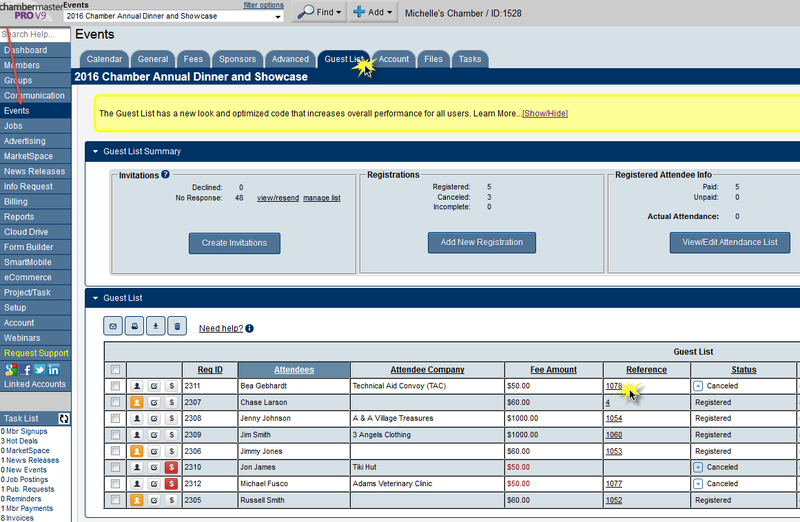 The display of your online Events calendar may be customized through a number of menu selections in the Setup module. Administrator permissions are required to make these changes. Changes made take effect immediately on your website. In addition to these selections, there is an option to create your own list of Event Categories that may be used to filter what is seen when visitors search your online calendar. Certain registration options may also be customized such as the available authentication methods for member registrations. These settings are for public modules version 1 and 2. Click Events Calendar: View/Edit Event Types. Click in the left-hand menu. Open the Registration and Billing Preferences section. The Calendar tab displays an Events calendar that may be displayed in five different views: list, day, week, month, and year view. As the name suggests, List view displays all events in a list format. The day, week, and month view will display all events falling within the specified date range. The year view displays a graphical calendar allowing chamber employees to advance quickly to a particular date. The calendar may also be filtered to display only certain events matching the desired criteria. Click clear filters to display all events again. Click Events in the left-hand menu. 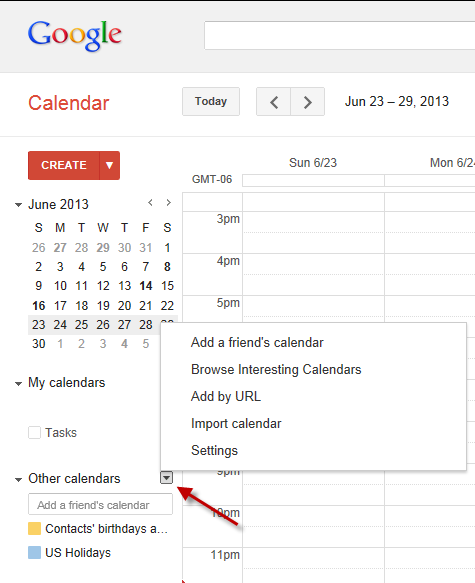 On the Calendar tab, click the Calendar View arrow to select the desired view. If necessary, click Prev and Next to decrease or advance the calendar. 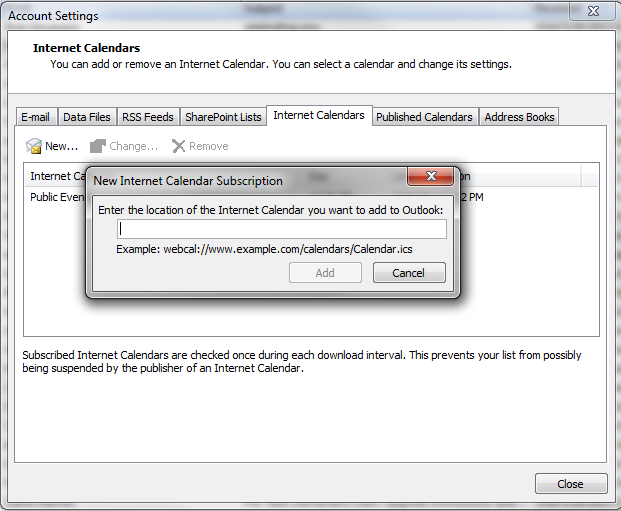 Alternatively, you may click the calendar icon and select the desired month to view. On the Calendar tab, click filter options. Disabled: an event that may or may not be current but will not be displayed on the public calendar; used to temporarily disable an event. 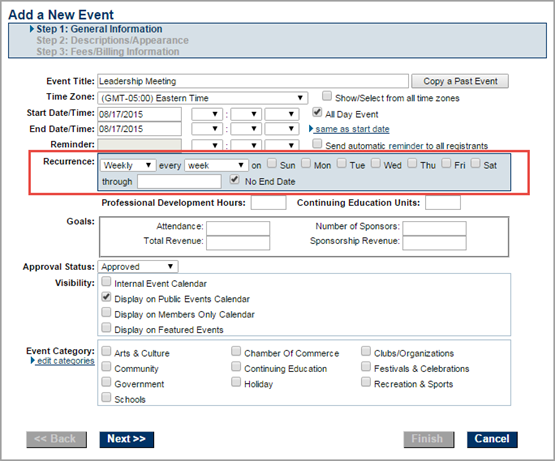 Chamber Calendar: When this option is selected, those events that you have made only visible to the chamber staff will be displayed. 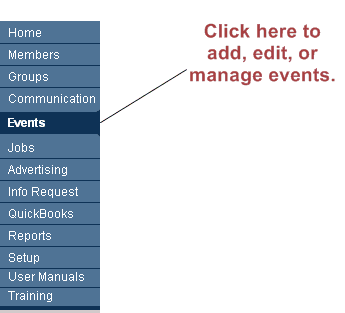 Members Only: When this options is selected, the events that you have made visible to the members will be displayed. 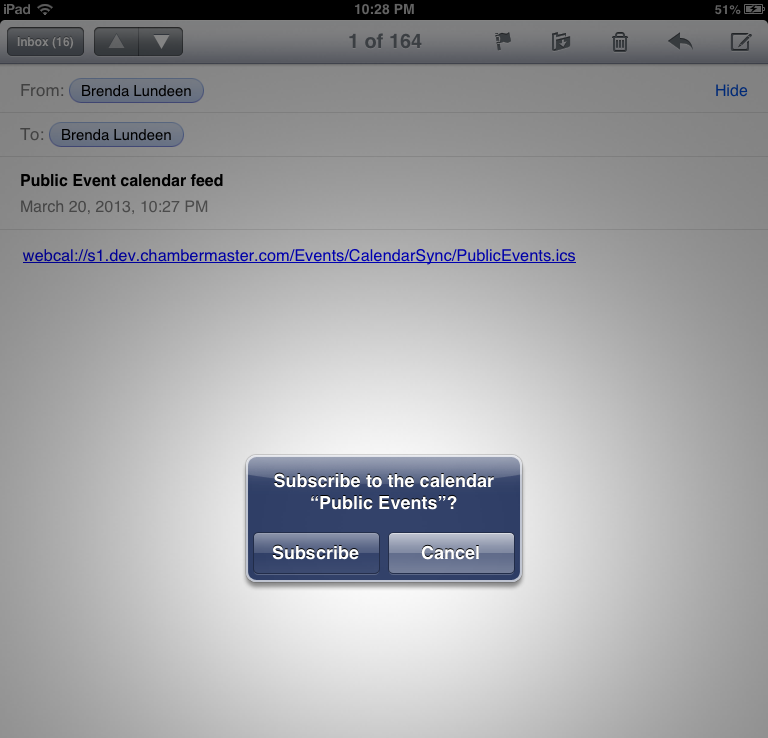 Public Calendar: When this options is selected, the events that you have made visible to the public will be displayed. Category: You can filter the calendar to just a selected category. Keyword: Keyword must be a single word. Multiple single words may be specified which returns all events with either word. For example, keywords ski swap will display all events with ski OR swap in the title or description. NOTE: When finished viewing the filtered list of events, click clear filters to view all events. 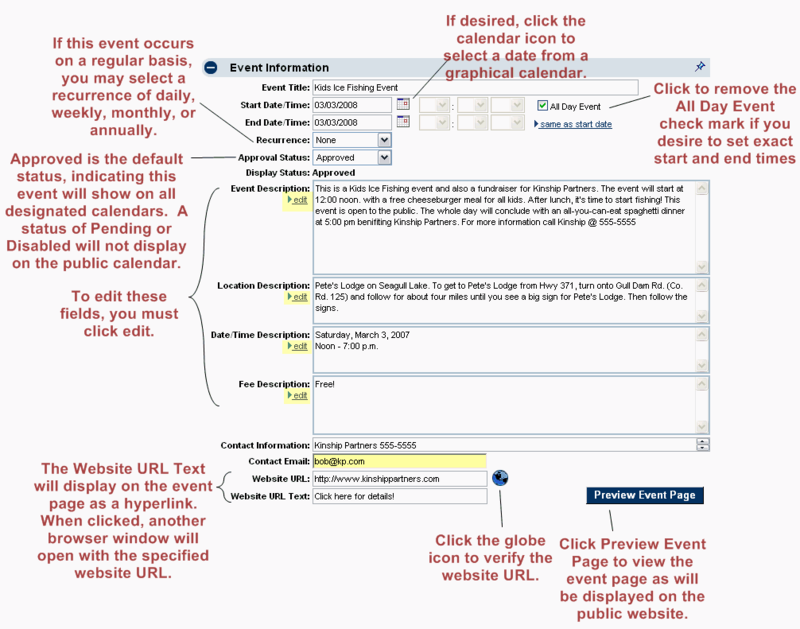 To edit event descriptions or dates, add photos, sponsors, participants or to modify any aspect associated with an event, the event must be selected and displayed in the Events drop-down list. 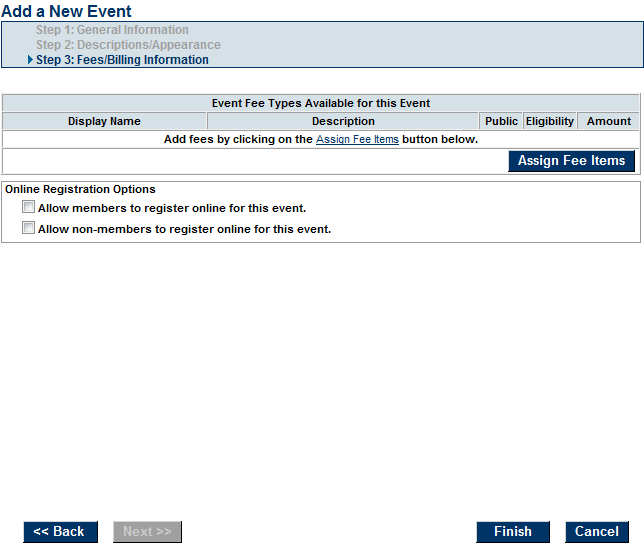 Within the Events module, click the drop-down arrow to the right of the Event name. On the Find menu, click Event. 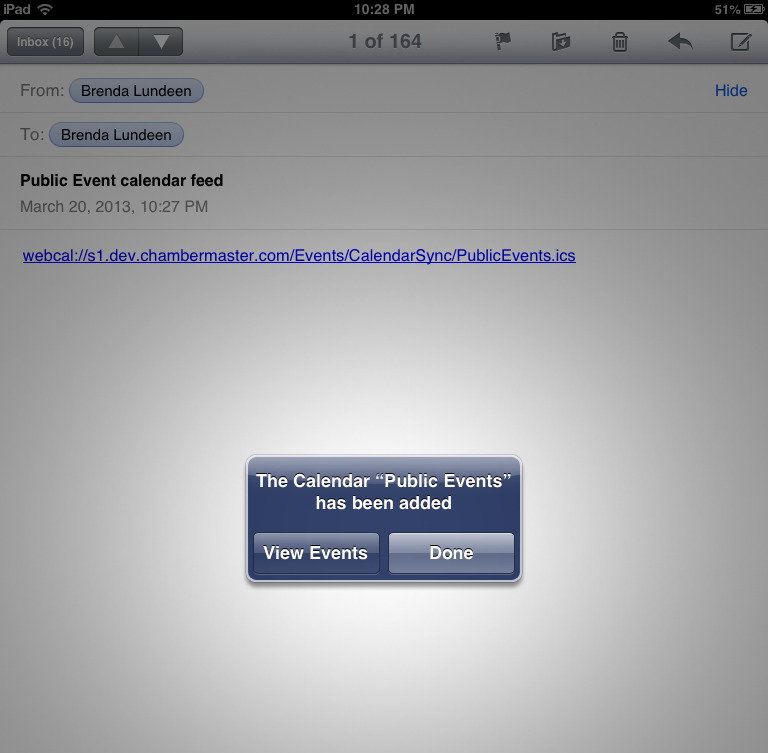 Click the desired event name. In the Events module, click the Calendar tab. Advance the calendar to display the desired event. Click on the desired event title. You may add an event using one of two methods. Adding an event to the calendar may be done at any time using the Add menu OR by clicking the +sign when the Calendar tab is displayed, which uses the calendar to assist in date selection, or by nightly importing your iCal feed. Click Add in the header bar. Click Event. The Add a New Event wizard will be displayed. 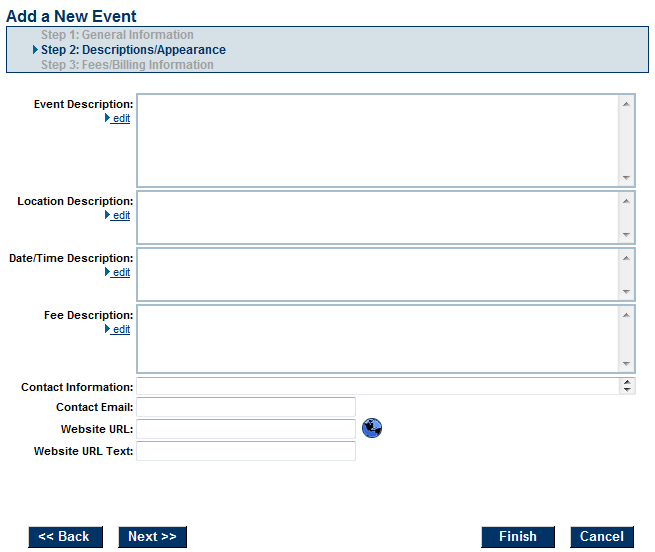 Event Title: This title will display in your Events drop-down list and also on the Event web page. Start/End Date/Time: Enter the correct dates for the event. A different end date is only needed when a single event runs multiple days – like over the weekend. #:*All Day Event: Deselect this checkbox if you desire to display exact times. Time may also be specified in the Date/Time field on the next window. Recurrence: An event occurring multiple times on your calendar may be duplicated by setting a recurrence. See Create a recurring event. Approval Status: Approved status will display this event on all calendar marked under “Visibility”. Status of Pending or Disabled will not display on the public calendar. Visibility: Check the calendars on which you wish to display this event. 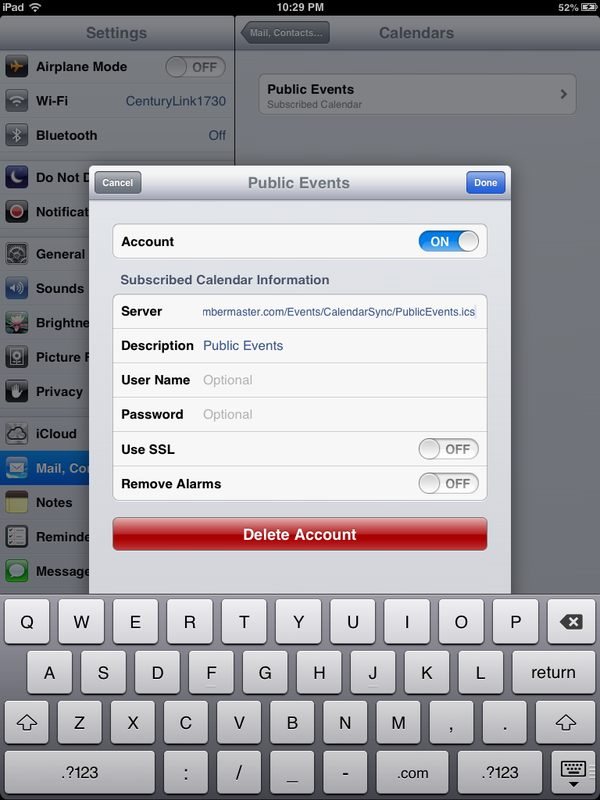 Note: all events regardless of these checkboxes will display on the Events Calendar tab. Internal Chamber Event Calendar– When this option is checked the event can be filtered separately on the internal calendar system when you go to Events > Calendar tab and click on filter options. 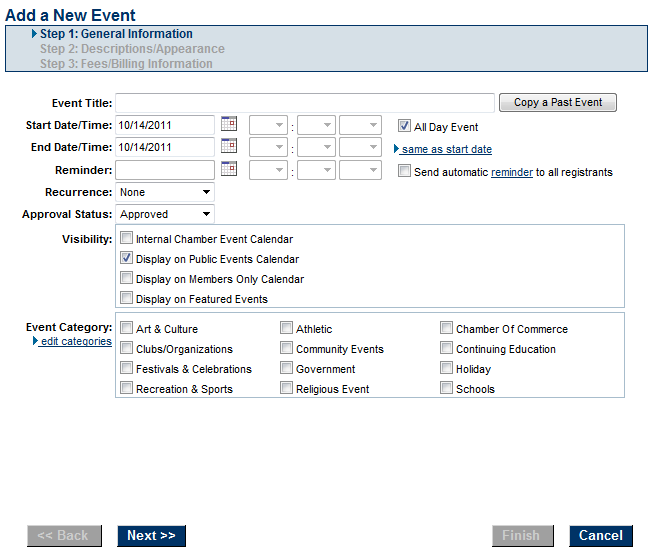 Display on Public Events Calendar – When this option is checked the event will display on the website’s calendar as well as the upcoming events list. This option must be selected in order for the event to show on your public website. 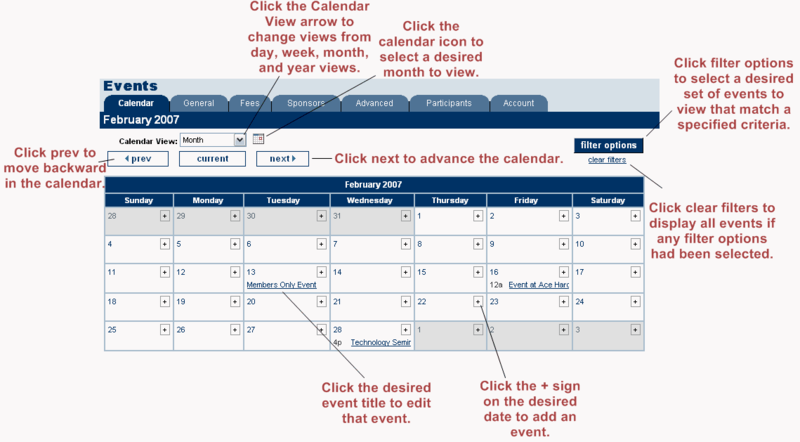 Display on Members Only Calendar – When this option is checked the event will display on the Member Information Center (Members Portal) after they log in. This option must be checked for the event to show on the members’ calendar in the Member Center. 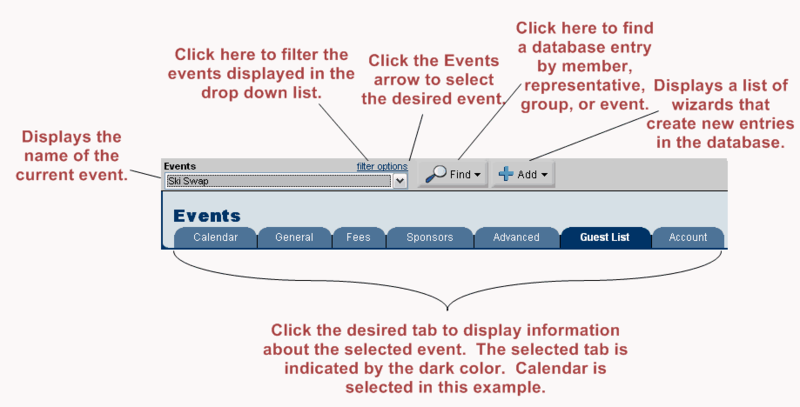 Display on Featured Events – This option allows for this event to be listed as a featured event on the featured events list. Event Category:Select the categories to which you ant to assign the event. as many categories as desired for this event. Website visitors may search for events by category on the public website. The Administrator may add/remove categories, by clicking edit categories. Click Next. The Description/Appearance settings will be displayed. Event Description: Enter a description of the event. Click the advanced edit link to format the text as desired for display on the website. Location Description: Enter location details. Click the advanced edit link to format the text as desired for display on the website. Date/Time Description: Enter date/time description to be displayed on the web-site. Click the advanced edit link for additional formatting options. Fee Description: Enter fee description to be displayed on the web-site. Click the advanced edit link for additional formatting options. Search Description: Enter the description to be displayed when events are searched. Contact Information: Enter the name of the contact for this event. Contact Email: Enter the email for the contact. Website URL: If applicable, enter the URL to a website that provides further information about the event. Website URL Text: If applicable, enter text for the URL. Click Next. The Fees/Billing Information screen will be displayed. Assign Fee Items: If fees will be associated with this event, click Assign Fee Items. In order to be assigned, fees must first be created by someone with Finance or Administrator permissions. Fees can also be assigned later on the Fees tab of the event. Online Registration Options: If desired, select to allow members and/or non-members to register online for this event. Selecting this checkbox will immediately display the Register button on the public event page. This selection can also be turned on later on the Fees tab of the event. After creating a new event, work with the tabs in order as displayed. For example, after completing the General tab, setup the fees (if applicable) on the Fees</span> tab. The Sponsor tab would be next, the Guest List, and finally the Account tab. You may complete them out-of-order if desired but there is a logical flow if working from left to right. The main concern would be to have the fees in place before registering guests and sponsors. If your association has an event which occurs on a regular basis, save time by setting it up as a recurring event. Most the details of the original event will be applied to the recurring instances. A notable exception is Fees, which must be set for each instance. Important: Once an event is listed as a recurring event, each event instance will be displayed on the calendar at the appropriate date/time where the instance may be modified on an individual basis or ALL instances may be changed at once by editing the original occurrence. Note: After an instance has been edited individually, it will no longer accept the changes from the original occurrence. On the General tab, click the Recurrence arrow and click the desired recurrence. Complete the Recurrence fields for the selected recurrence. NOTE: If you are already on the General tab of the original event, you may click edit specific instance and click to select the desired instance to edit. Advance to the date of the desired instance. Click the title of the event. To edit all instances of the event, you may also click the original event on the Calendar to go directly to the original event. After an instance has been edited individually, it will no longer accept the changes from the original occurrence. Click the title of any event instance of the desired event. In the Recurrence field, click the title of the original event. Click Copy a Past Event. 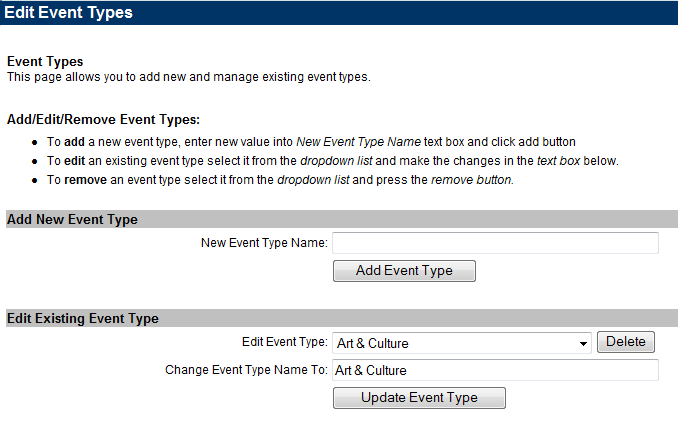 Type the name of the event in the Event Name text box and select or scroll through the list and select the desired event. Click Continue. The General Information, Descriptions/Appearance, and Fees/Billing Information will be copied from the past event. iCalendar (iCal) is an open standard for exchanging calendar and scheduling information. iCal feed enables an application to fetch, push or syncronize date and time based data to an another calendar application. The ChamberMaster/MemberZone iCal feed import provides an ability for you to upload your iCal list (from the Cloud drive or other http url used with iPhones, iPads etc and other similar calendars) and import directly into the event calendar. A URL is specified to the location of this iCal and then each night the events are synched. 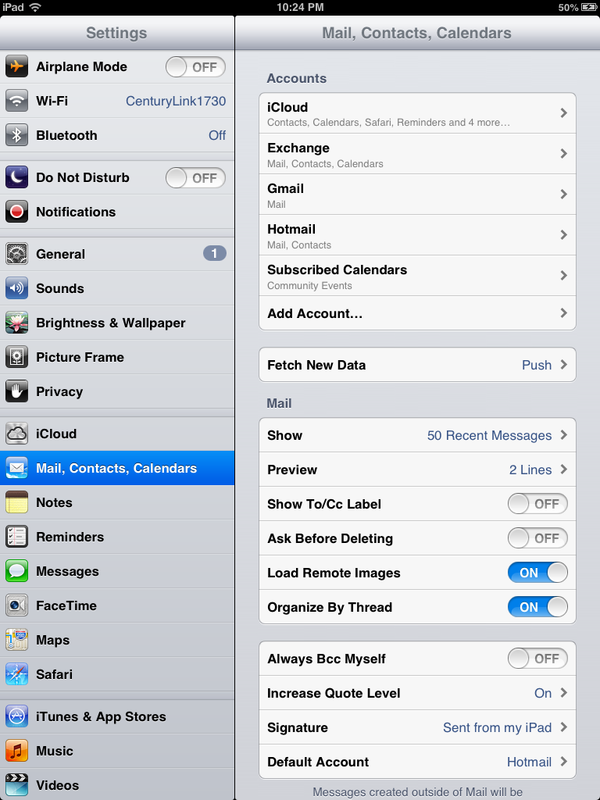 Note: Recurring events are not supported with the iCal import feature. Open the General Settings area. Click the +Add button in the iCal Import section. Type the URL of the iCal feed. Note: Once an iCal has been added, the events on that calendar may take up to 24 hours to display on your event calendar. Facts displayed about an event are based on information from the event’s General tab. The Event Title, Start Date/Time, End Date/Time, Contact Information, Website URL, and Approval Status may be modified here. In addition to this basic information, the Event Information area contains the Event Description, Location Description, Date/Time Description, and Fee Description, which is typed into the built-in editor allowing formatting of the text such as bold, underline, font size and style changes. In the Events module, select the desired event. On the General tab, modify the desired fields. Photos, images, a map and a video may be added to the event page. One photo may be added as a Main Event photo that is automatically positioned within the event description area, and/or multiple photos may be included in the Photo Gallery which displays in thumbnail size at the bottom of the event page but will be enlarged when a consumer clicks the image. Images are automatically resized to accommodate the space allowed. Images must be .jpg or .gif. A map to the event location may be included by uploading your own .jpg or .gif image or pointing to Google Maps. One YouTube video may be displayed on the event description page as well. The Search Results Icon will appear for visitors in your public events list making it easier to spot. NOTE: It applies only with version 3 public modules or greater. Select the event's General tab. If needed, expand the Photos & Images section. Click the + icon for the Search Results Icon. Click a previously imported image, or click the Upload button to navigate to your icon. Crop the image if needed. One of the first things visitors to your event page will notice is the header. Grab their attention with a splashy header that will make them want to learn more. NOTE: For best results, upload an image that is a minimum of 1200 x 225. A larger image will be downsized appropriately but will maintain the aspect ratio so not to distort the image. A smaller image will not be increased to avoid distortion. Expand the Photos & Images section if needed. Click the + icon in the Event Header Photo section. Click an existing file, or click Upload to navigate to the desired file. Your event header image has now been added. On the General tab, click Add Image in the Action column of the Image Type that you wish to add in the Photos & Images area. Type the path and filename of the desired graphic file or click Browse to locate and open the desired graphic is located. NOTE: Only one Main Event photo may be added which is automatically positioned within the event description area. However, Gallery Photos may contain multiple images which display in thumbnail size at the bottom of the event page but will be enlarged when a consumer clicks the image. Photos may also be added to the Event Description. Click Add/Edit Image while editing the description text. On the event's General, click Remove Image in the Action column of the Image Type that you wish to remove in the Photos & Images area. NOTE: There is no confirmation required, the images will be immediately removed. On the event's General </span>tab click Change Image in the Action column of the Image Type that you wish to change in the Photos & Images area. On the event's General, click Add Video in the Action column in the Photos & Images area. Type or paste the YouTube “share link” for the desired video into the Event Video field. You may upload a map image of include address information to display the location of your event in Google maps. On the event's General, click Upload Image in the Action column in the Photos & Images area. Click Add Image in the Action column. Type the path and filename of the desired graphic file or click Browse to locate and click Open when desired graphic is located. On the event's General, click Google Maps in the Action column in the Photos & Images area. Enter Street Addr and City/State/Zip. NOTE: Click on View Map to preview the map location. 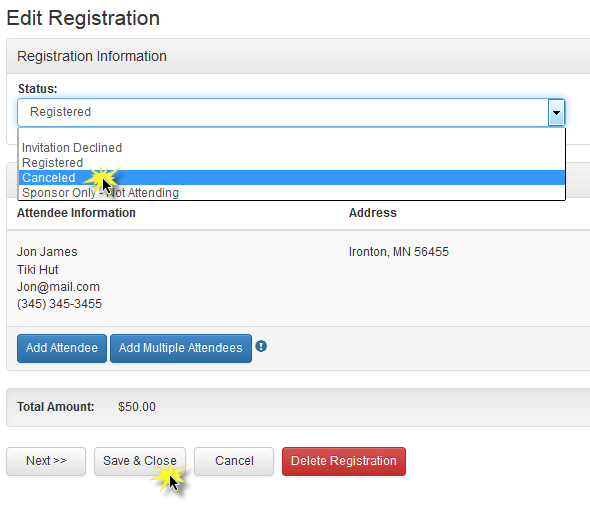 Custom Event registration fields provide an opportunity to gather further details during the registration process. For example, you may need meal choices, dietary restrictions, golf handicap, etc. From the Advanced tab click to expand Custom Registration Fields. Field Name: This is the field name displayed in the database. Public Display Text (optional): This is the text that will be displayed on the event registration form. For example, if you are creating a "Meal" field for selection of a meal choice on an Event, you may wish the enter "Please select your meal choice" to be displayed to the public. Data Type: Select the type of data expected as a response to this question. See Custom Field Types for further information. If Text is selected as the data type, enter the maximum number of characters allowed. If Drop Down List is selected as the data type, enter choices. Click Continue to save the custom field. Internal Chamber Events. 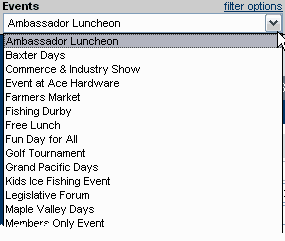 All calendar events will automatically display for your Chamber staff on the Calendar tab no matter what selection is made for the Visibility check box but if selecting “Internal Chamber Event Calendar”, you will be able to filter by this selection on the Calendar tab. On the General tab, click the desired visibility check box(es). 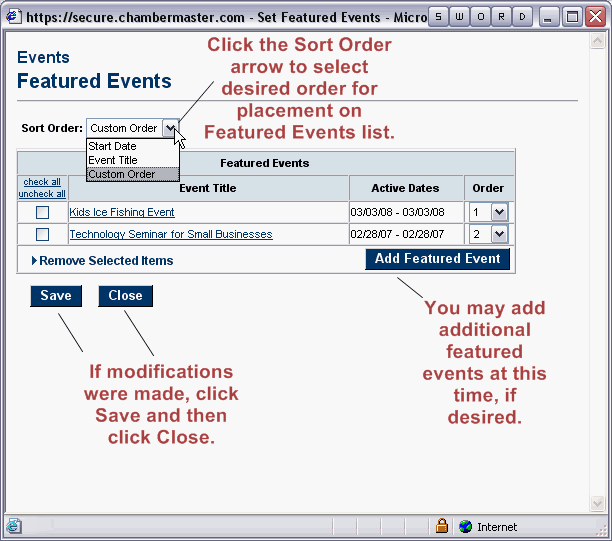 If selecting Display on Featured Events, complete the Featured Events window by selecting Sort Order and desired Order. Then click Save and Close. 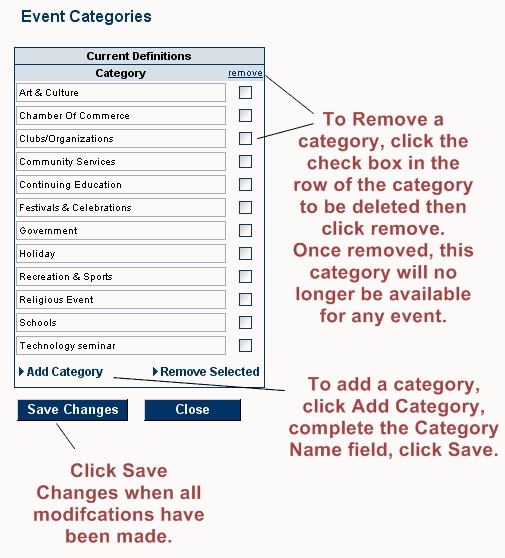 Event categories are a way by which events can be filtered on your web-site. Click edit categories in the Placement Options area. Enter the name of the category in the Category Name: text box. You can add event registration instructions to be displayed on the registration form, and also customize a message displayed after the registrant completes registration. On the desired event page, click the Advanced tab. In the Registration Instructions text-box, type the message that you would like to appear at the top of the registration page. Click the advanced edit link for more editing options. In the Registration Confirmation text box, type the message that you would like to appear in the browser window after the registrant completes the registration form. Click the advanced edit link for more editing options. Click Save to save your messages. Events that require a fee to participate can be managed through the Events module. Event fees, designated for members or non-members, may be associated with each event. If allowing online registration, members-only pricing is available to those with a members-only login name and password. Staff control what payment options appear for members and non-members, with a separate set of options available for each. 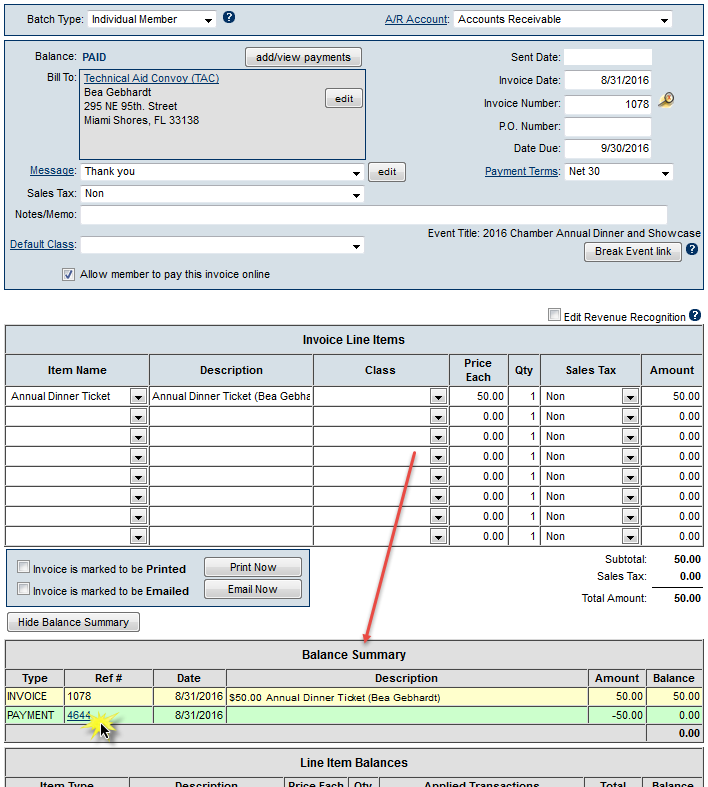 If integrated with QuickBooks or using the integrated billing module, individual invoices may be generated from the Events module for those requesting payment by invoice. Discounts based on age, date, or volume may be created for each event and applied when appropriate information is provided during registration. The Account tab displays a running total of the event income activity in addition to a summary of guest list information. 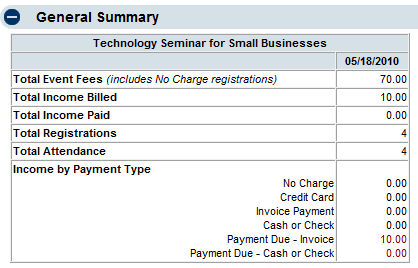 Once created, fees may be assigned to an event. If desired, multiple fees may be assigned to one event giving the ability to have separate pricing for members and non-members, pricing for sponsors, or any desired additional fee item. Assigning event registration fees may be done during creation of a new event by selecting Assign Fee Items on Step 3 of 3 or after creation on the Fees tab. When assigning fees after creation, event registration fees and additional fees items may both be assigned. Steps outlined below will specifically address assigning fees after creation but the same concepts can be applied to assigning fees during creation. Only one event registration fee may be selected per registrant. One or more additional fee items may be selected per registrant. Note: Only one event registration fee may be selected per registrant. 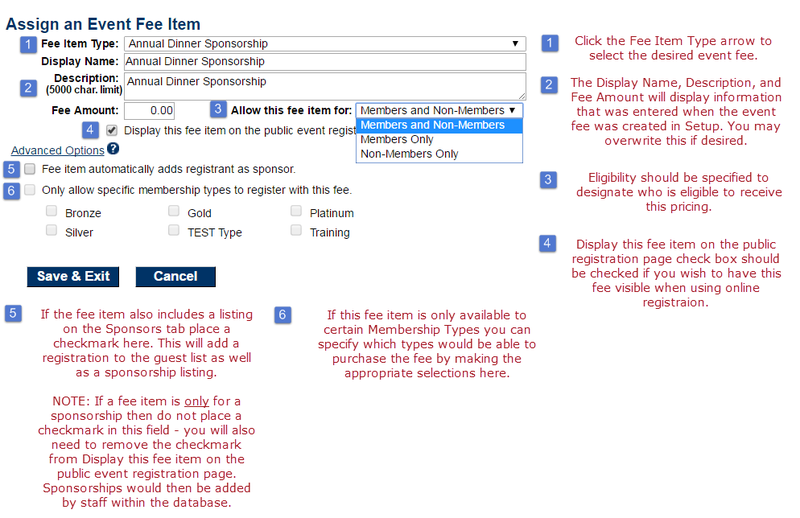 On the Fees tab, click Assign Fee Items in the Event Registration Fees area. Select the desired fee by clicking the Fee Item Type arrow. Complete other desired fields. See Figure 3-6. The Event Fee Display Name is limited to 50 characters. The Event Fee Description is limited to 100 characters. One or more additional fee items may be selected per registrant. NOTE: The fee items are only available to those who register (select a registration fee item) for the event. On the Fees tab, click Assign Fee Items in the Additional Fee Items area. 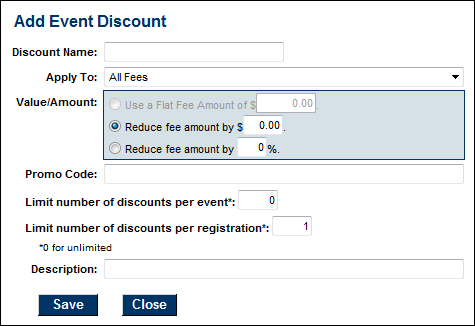 On the Fees tab, click the title of the desired event fee in the Event Registration Fees area or the Additional Fee Items area. On the Fees tab, click to select the check box in front of the desired item to be deleted. Click Remove Select Fee Items. Removing an event fee also removes any association with an event and makes it unavailable in event reports as well. Make sure that you no longer need access to this event fee before removing it. Registration and Billing Preferences must be configured if fees have been assigned or to indicate online registration preferences. Many of these preferences are available when you first setup an event on Step 3 of 3 or all selections may be made after you create the event on the Fees tab. Preferences include selection of online registration options for members and non-members, available payment methods, general invoice options and non-members invoice options (if applicable). In addition email confirmation notices and email notification of registration may be specified if desired. The steps outlined below allow you to setup preferences specific to the event you are working with. On the event's Fees tab, expand the Registration and Billing Preferences section. Online Registration Options - If allowing online registration but you do not select any acceptable methods of payment, upon registration a message will be displayed to registrants that the chamber will be in contact with them regarding the registration fees for this event. Allow registrants to request to be Invoiced for fees incurred. Allow registrants to specify that they will pay by Cash or Check at the time of the event. Allow non-members to register online for this event. When this option is selected, you may choose one or more of the following options (NOTE: The payment options selected here will be available to Non-Member, Prospective members, and the general public. Disallow online registrations after. Click the option if you wish to close registration at a certain date and time. Enter the date and time. Allow online registrants to include multiple attendees on a single registration. 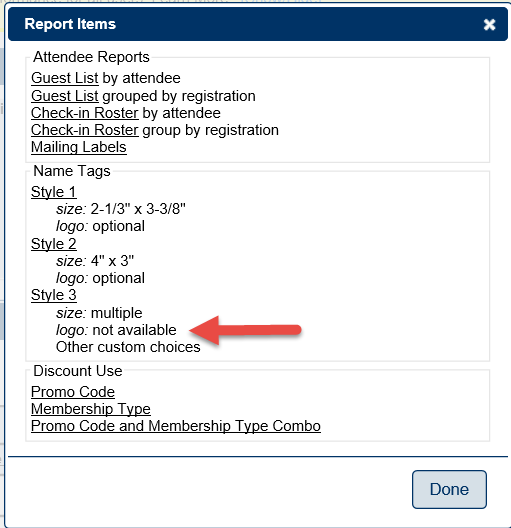 Click the option to allow multiple attendees to be included on a single registration. Send an automatic Registration Confirmation email to consumers registering online. Click this option if you wish to send an automated event registration confirmation. Note: Custom text may be included on the confirmation email. 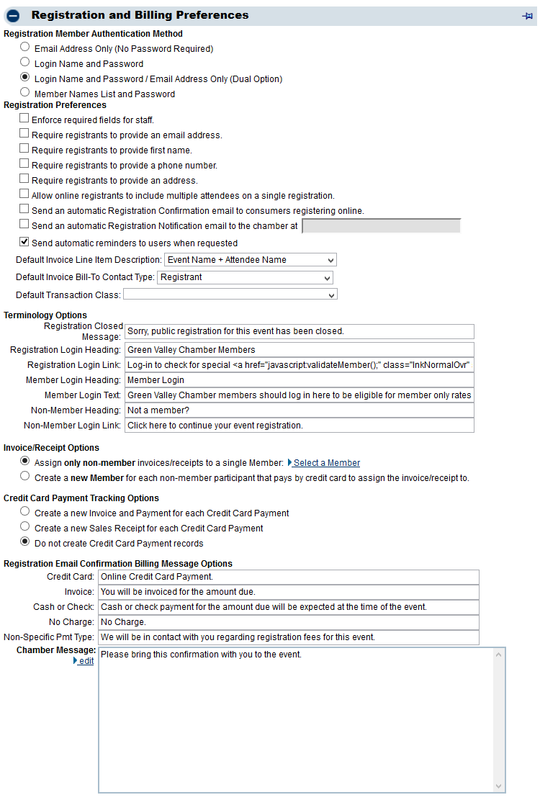 Put the desired custom text in the Chamber Message window in Setup > Event Options and Settings under the Registration and Billing Preferences area. If you have selected Send an automatic Registration Confirmation email to consumers registering online, the Include QR Code in Confirmation email for easy check-in option will be displayed. This option will include a QR Code in the event confirmation. At your event, using the Staff App, you can scan the users QR code right from their smart phone or a printed version of their email. Once scanned, the attendee will immediately be marked as attended in the system. NOTE: This feature is only available to those who have updated to the newest event registration. Send an automatic Registration Notification email to our association at. Click this option and enter the email address to whom an automated email message will be sent when someone registers for the event. 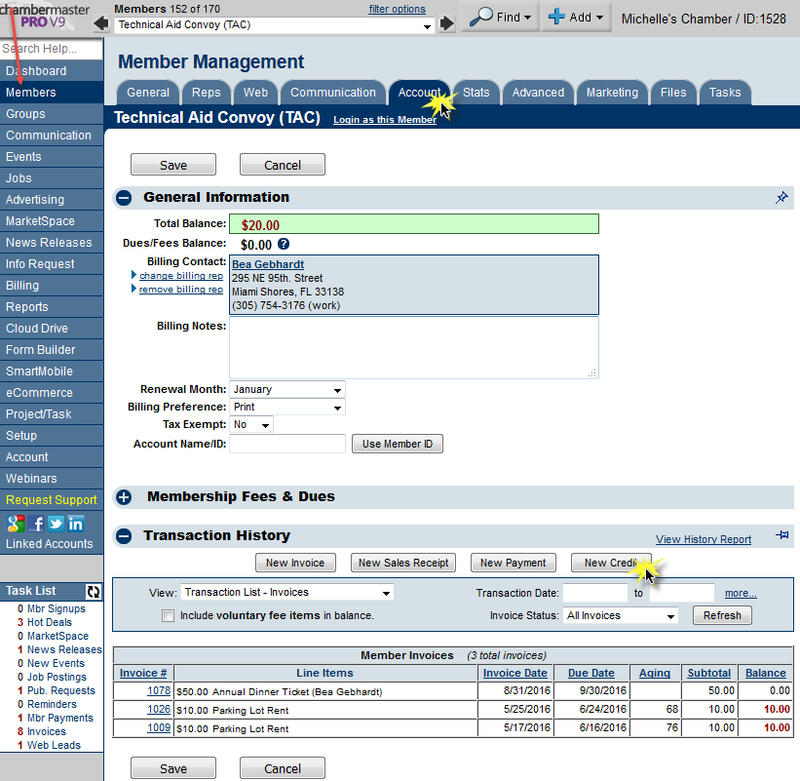 Assign non-member invoices or receipts to a single Member. Select this option to assign all invoices to one member (this is best practice). The default member you configured under Setup > Events Options & Settings is displayed. Click the hyper-link to select a different member. Create a new Member for each non-member participant that pays by credit card to assign the invoice/receipt to. Select this option if you want a new member create for each non-member participant. From the drop-down list, select the member status to be associated to the new member. Credit Card Payment Tracking Options - these options allow you to configure how you wish to track credit card transactions. Your accounting practices will drive your choice. Create a new Invoice and Payment for each Credit Card Payment. Create a new Sales Receipt for each Credit Card Payment. Do not create Credit Card Payment records. Create a new Quick Books Customer for each non-member participant - this is only available for CQI users. Any event may have special discounts available and applied to all or selected fees. Discounts based on age, date, or volume may be created for each event and applied when appropriate information is provided during registration or the discount criteria is met because of date or volume. 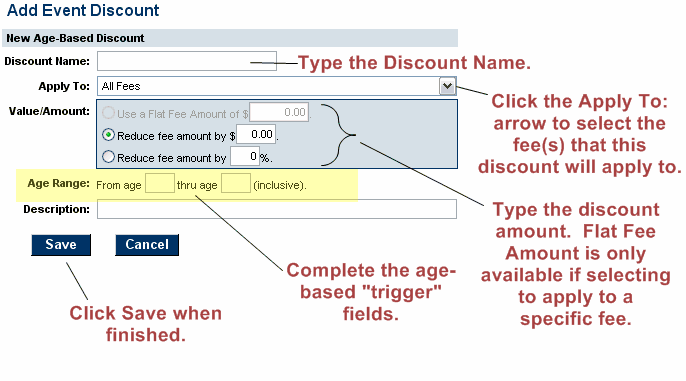 On the Fees tab, click Add Discount in the Discount Options area under the Age-Based Discounts section. Complete the Add Event Discount screen. 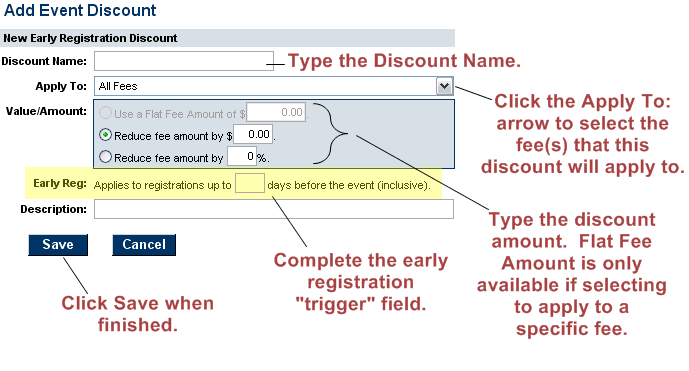 On the Fees tab, click Add Discount in the Discount Options area under the Early Registration Discounts section. 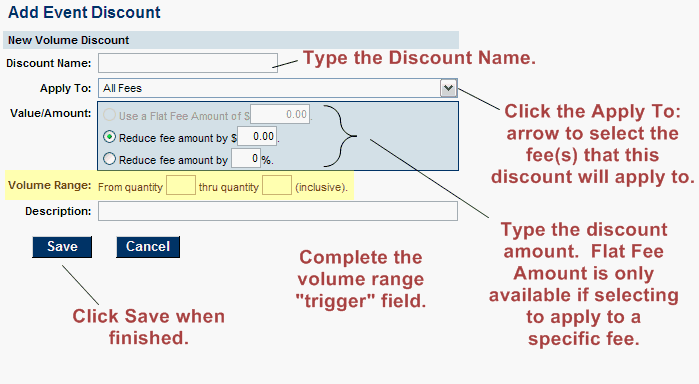 On the Fees tab, click Add Discount in the Discount Options area under the Volume Discounts section. 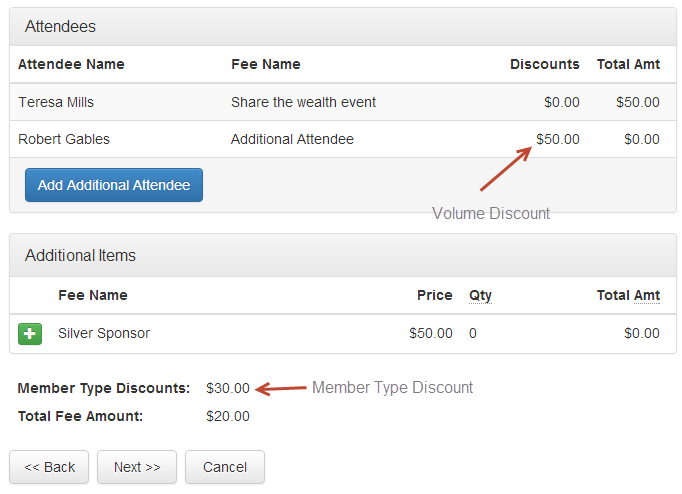 When members or visitors register, upon checkout they will see the volume discount specified in a Discount column. See event discounts by membership type in action. 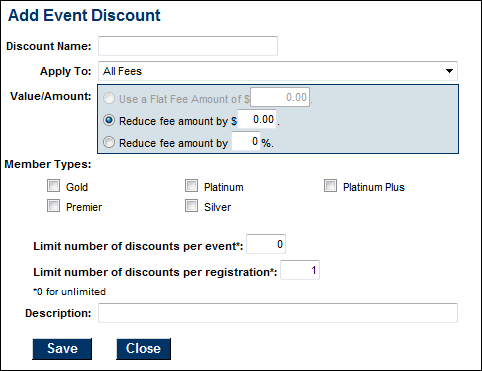 On the Fees tab, click Add Discount in the Discount Options area under the Membership Type Discounts section. Idea: Grant discounted, free, or included benefits to specific membership types. Total discounts used per event may be specified and a separate limit per registration is also available. For Plus edition or greater only. On the Fees tab, click Add Discount in the Discount Options area under the Promo Code section. Idea: create a Promo Code on your Event Fees tab and then post your promo code on specific advertising so you can track the effectiveness of the ad or provide this promo code to a select group of attendees. Make sure to create different promo code for each discount. Create multiple codes for each event if desired. Limits on usage are available at the event level and registration level. Running totals of income billed and paid, registrations, invitations, and a list of event sponsors for an event can be viewed on the Account tab. Totals are automatically updated as entries are made. If integrated with QuickBooks or using the integrated billing module, individual invoices may be generated for members from the Events module for those requesting payment by invoice or for those registrants designated as such by chamber employees when completing registration. If registration is accepted for individuals that are not chamber members, invoices may also be generated if desired. Two options for creation of non-member invoices are available: create a new member record (or QB Customer with QuickBooks integration) for each non-member participant or assign non-member invoices to a single member (or QB Customer with QuickBooks integration). Creating invoices vary slightly dependent on which module you are using - - QuickBooks or Billing. Follow the instructions in the appropriate section below for creating your event fees. Defaults may be set for these options but may also be changed right before creating the invoices. Make the desired selections in the Billing Preferences area. You may also create event invoices by clicking the Event Invoices tab after selecting the QuickBooks module in the left-hand navigation bar. If registrations have specified a payment method of “invoice” and the invoice has not yet been created, a selection will appear indicating the number of invoices that need to be created. Or if credit card payment has been accepted and Credit Card Payment Tracking Options are set to create either an invoice/payment or sales receipt, a selection will appear indicating the number of entries that need to be created. If the Create Entries Now button does not appear, there are no transactions to be created at this time. Click Create QuickBooks Entries Now. 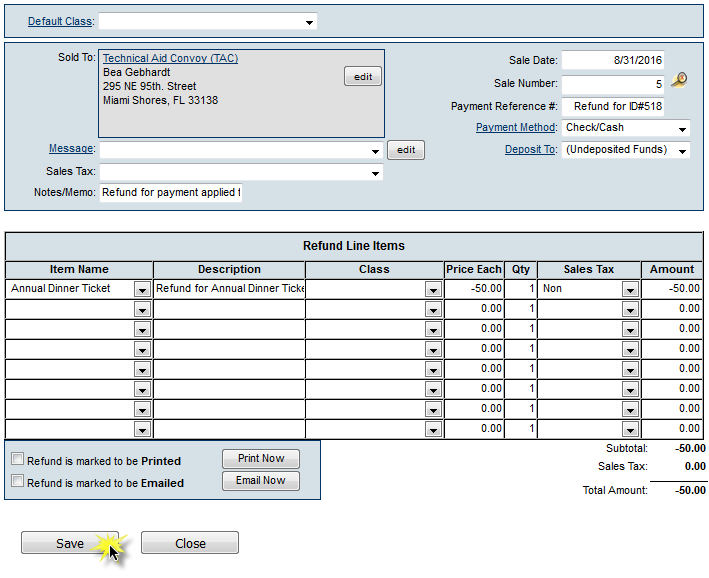 Make desired changes in the Invoice Options area. If the Create QuickBooks Entries Now button is not available (dimmed out), you may need to verify your QuickBooks connection. This may be done at the top of the Event Invoices tab or by selecting QuickBooks Connection Settings in the Setup module. Invoice creation begins. Click Refresh Status Now to display the current status for completed invoices. When Invoicing Complete appears, click Refresh Status Now to view a complete status list of all invoices. These invoices now exist in QuickBooks and are marked to be printed. You may view and print them in QuickBooks according to standard QuickBooks procedures. If a payment method of Invoice is selected, this invoice will be queued and then created at a time of your choosing. If a payment method of Credit Card is selected, one of three results will happen depending on your choice: an invoice and payment will be automatically created, a sales receipt will automatically be created, or no transaction will happen. Make these selections for each event on the Fees tab of the desired Event. 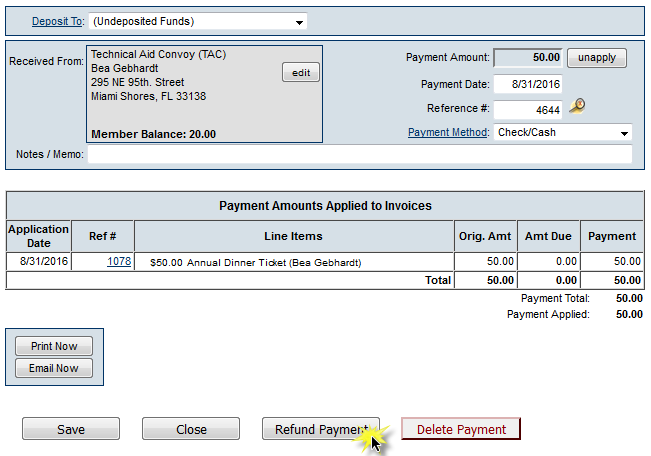 Event invoices may be created from within the Events module or from the Billing module. Either way of creating invoices accomplishes the same task. In the Event Module, select the desired event. If there are invoices to be created, the Create Invoices Now button will be displayed. If the Create Invoices Now button does not appear, there are no invoices to be created at this time. Make any desired selections in the Bill To: which allows you to specify to whom the invoice should be addressed, and which items should be on the invoice line. box for who the invoice should be addressed to and what items should appear on the invoice line. If you wish to apply any available credits a member may have available on their account, click Auto-apply available credits on invoices checkbox. If desired, select a Message that will be printed on each invoice. Note: Click edit to modify the message or create a one-time custom message to display on all invoices. Complete the rest of the fields including Invoice Date, Date Due and Payment Terms. In the list of invoices, uncheck any invoices that should be excluded from this Batch. Note: All excluded invoices may be added to this batch later. Click Save Batch or Deliver Invoices. If clicking Save Batch, you can return to a batch of invoices at any time to deliver them (email or print them). If clicking Deliver Invoices, continue to the next step. Either choice, Save Batch or Deliver Invoices, will create the batch of invoices. Deliver Invoices will create the invoices and immediately open a window with options to print and/or email the invoices. If you have selected Deliver Invoices the Deliver Customer Invoices window will appear. The Delivery Method of Print Invoices is already selected. Those invoices with an Output selection (from the previous window) of Print or Both will be selected. Those invoices with an Output selection of Email or None will not be selected. Also, any invoice that does not have complete mailing address information will not be selected. NOTE: Changes made to the Contact Name or address on the Deliver Customer Invoices window does not modify the Member’s Account information. Permanent Billing Rep or address changes must be made in the Members module. Complete the Delivery Method selections as desired. Note: A default Invoice Template may be selected as desired by clicking '''Setup''' > '''Billing Options''' and '''Settings'''. Open the '''Appearance''' area and select a new '''Default Template'''. The templates may also be edited at this location. See “Invoice Templates” for more information. When ready, click Preview Invoices or Print Invoices. If mailing labels are desired, click Print Mailing Labels in the Delivery Method section. Note: When viewing the Member's Account tab after billing: The Next Billed column in the Membership Fees and Dues area reflects the name of the monthly batch that this fee/due will be included in or already has been included in. This column will automatically display the next billing month when the current date passes that month. For instance, if the current date is February 2015 and a fee/due is set to be billed in February 2015, the Next Billed column will display February 2015 until March 1, 2015; then it will automatically switch and display February 2016. To see if a particular fee/due has been billed, refer to the transactions displayed in the Transaction History area. If any invoices need to be emailed, click Email Invoices in the Delivery Method section. You can add sponsors through the database, or sponsors are added automatically when a registrant selects a registration fee that you have designed to automatically add as a sponsor. NOTE: You must have fees setup for sponsorships prior to adding sponsors. In the desired event, click the Sponsors tab. Select the appropriate sponsorship registration fee. Complete the registration form and check-out. NOTE: While the system provides the functionality to remove a sponsor, best practice is to cancel the registration associated with this sponsor. When you remove a sponsor on the Sponsor tab, this will also delete their event registration. On the Sponsors tab, click the check box in front of the desired sponsor’s name in the List of Sponsors. On the Sponsors tab, click the desired sponsor’s name in the List of Sponsors. The selected row will be highlighted in yellow. Click the Edit Registration icon. Click 'Add Attendee and complete the registration form. Sponsor logos may be uploaded and placement determined. In addition, a logo website link for the sponsor may be activated. A sponsor logo will automatically be displayed for the Sponsor Logo if a logo has been displayed for this sponsor-member before on any other event or if the member has a logo uploaded for their member logo in the Member Information Center. Sponsorship levels may also be created and assigned appropriately to each sponsor. Sponsors may also be assigned a certain sort order. NOTE:A sponsor logo will automatically be available, if a logo has been previously uploaded for this sponsor-member or if the member has uploaded a logo in the Member Information Center. Click Add Image in the Sponsor Web Display Options area. Type the path and filename of the desired graphic file or click Browse to locate the desired graphic. Select logo placement by clicking the Logo Placement arrow. Select from: Right Column, Page Bottom or Do Not Display. On the Sponsors tab, click the desired sponsor’s name in the List of Sponsors area. The selected row will be highlighted in yellow. Click Remove Image in the Actionscolumn of the Sponsor Web Display Options area. Click Change Image in the Action column in the Sponsor Web Display Options area. Default sponsorship levels may be created to use on events as desired (so that you only create the levels once and may use multiple times). Also, each event may have a unique set of sponsorship levels defined. Default sponsorship levels will be available to use on each event if desired. For each level, select whether the Sponsorship Level Name should display on the website as a heading for those listed under this sponsorship level. Click Edit Default Levels in the Sponsors area. Type the name of the new sponsorship level in the Name field. Select the desired Appearance option: “Display Heading” or “Do Not Display”. Optional: Change the order in which the sponsorship levels will appear on the website. 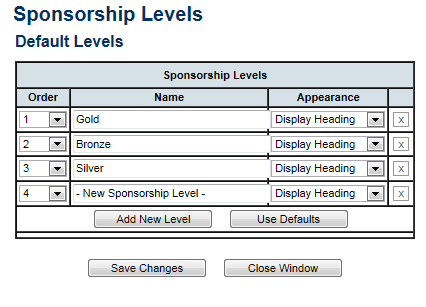 Click Edit Sponsorship Levels in the Sponsor Web Display Options area. Click Add New Level to create a unique sponsorship level for this event or click Use Defaults to automatically display the default list of sponsorship levels that were created in the Setup module. (See “Create default sponsorship levels” above.). Continue adding, editing, and removing sponsorship levels until the list is as desired for this particular event. Note: any editing here does not affect the default sponsorship levels list created in the Setup module. On the Sponsors tab, click the Reports arrow. NOTE: If you have recently made the move to the updated Guest List, click here for an overview. 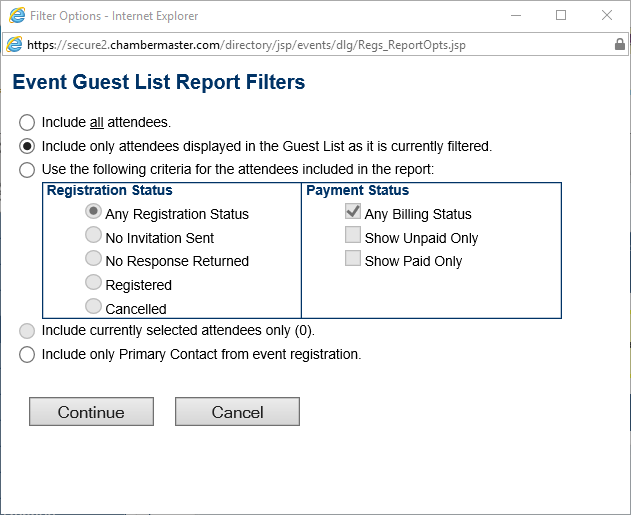 When registration rosters and attendee lists must be tracked, a complete solution for managing participants is provided through the Guest List tab. Participants may be added using member or representative names in the current database, added as new by a chamber employee, or automatically entered by the participant if online registration is enabled. In addition, invitations may be sent to prospective attendees, resent to those who have not responded, and continually monitored, sorted, and reported on using the registration status column in the Guest List. Output from the registration list consists of a roster sheet, mailing labels, name tags, and a printed list. Filter options may be applied to any output, filtered by registration status, payment status, or other self-selected filters. For example, emails may be sent, targeting only those registered or those still not registered, or many other combinations using the available filter options. Downloading this same information to a comma separated value (.csv) file is also available. Sending invitations to attendees is not required in order to maintain a list of participants. However, if invitations will be sent, it is most helpful to send the invitations before creating the participant list. Invitations may be created and sent via email using the Guest List Summary area on the Guest List tab. Mailing labels may be specifically generated for this group using the output options for mailing labels. During the course of time, if invitees have still not responded to your invitations, you may decide to resend your invitation. The database will keep track of who has received an invitation but has not yet registered so that you may easily target those that might need a second or third reminder. Select the attendees that should receive invitations using one or more selections available under Add Invitees, Add Members, or Add Representatives. Repeat until your invitee list is complete. NOTE: Invitees that already appear on the Guest List will automatically be marked with an asterisk and may be removed by clicking Remove to avoid accidental duplication of these invitees on the participant list. Complete the Send an Email invitation screen. Click Send Email Now or you can choose to send the email at a future date. On the Guest List tab, click the view/resend link. Review the list, and update if needed. NOTE: If you saved the original invite, you will be able to select it from your templates. On the Guest List tab, click the Manage List link in the Invitations section. Click the Register link for the participant you wish to register. Complete the registration, and check-out. Click the Decline link for the participant who is declining. Click the Comment link for the participant on whom you wish to comment. NOTE: You can add to, edit, or remove this comment at any time. If you have checked Enable waiting list on the General tab, if you have reached the Limit Attendee Count To number, people wishing to register for the event will be notified that the event is full and asked if they would like to be placed on a waiting list. If the user clicks Yes please, they will be able to enter their name, and the number of guests they wish to bring. The Waiting List on the Guest List tab will be updated by the number of guests they entered. If registrations come available for the event, you can manage the waiting list on the Guest List tab. Click Manage List adjacent to Waiting List. A list of all individuals on the list will be displayed. Click the Register link if you wish to register an individual, or click the Remove link to remove an individual from the list. The Guest list is created manually by registering guests through the back-office, or through on-line registrations. Registered - This status will be displayed when someone registers on-line, or when a staff member registers for them. Invitation Declined - This status will be displayed when an invitee declines the invitation, or a staff member declines for them. Cancelled - This status will be displayed when a registration is cancelled. Incomplete - This status will be displayed if a registrant exits the registration check-out page, without making payment. Click the Add New Registration on the Guest List tab. The registration page will be displayed. Enter required contact information for the registrant. Occasionally someone will register for the wrong event and you may want to move their completed registration to the correct event. Follow these steps below to complete this task. Cancel the registration on the incorrect event. This doesn't affect any invoice or payment it simply cancels that registration on that event. To cancel the registration click the edit registration icon on the guest list and change their registration status to cancelled. Next create a new registration for that person on the correct event using their appropriate fees. Complete the registration with the payment option invoice selected. When you return to your guest list click the edit payment icon to open up the payment options for this registration. Change the payment status to paid. In the Invoice Ref # field enter the invoice # from their original registration. You can edit this field even though it is grayed out. (Optional) Go to that invoice and associate it with the correct event. Click Break Event Link to disconnect the invoice from the previous event. Now the Break Event Link button has changed to Associate with Event click this and select the correct event the new registration was created on. Click Save to save the association before closing the invoice. Re-associating the invoice isn't required unless some specific event based reports are being used. You can easily resend an event confirmation to a registrant from the event's guest list. Click the Guest List tab. For the desired registrant, click the Registered link in the Status column. Click the check-box next to the person to whom you wish to send the confirmation. Select a sender from the Confirmation Sender: list. If someone has registered for an event, but chosen the wrong fee item and has already paid or been invoiced, complete these steps to cancel the registration so you can create a new one with the correct fee item. Note: If the registrant has not paid or been invoiced, simply edit the registration by clicking the Edit Registration icon and change the fee item. See Figure 1 below. Note: If there is a Reference number located on the Guest List, a transaction has been created. Note: If Sales Receipts were created the refund process will require a negative sales receipt to be manually created through the Members ➝Account➝ Transaction History➝ New Sales Receipt location. In this scenario, best practice is to write off the invoice. Click on the invoice reference number for which you wish to create a write-off. Follow the steps for Process a Write Off to complete the write-off. Click the envelope icon, located in the Guest List section. Include only attendees displayed in the Guest List as it is currently filtered. Include currently selected attendees only. Include only Primary Contact from event registration. Click Continue. The Send an Email screen will be displayed to complete sending your email to multiple guests. Note: Only those with Plus edition or greater and SEO modules will have this feature. An automatically generated reminder email can be sent to all registrants on an event's Guest List with a status of "Registered". 1. Click Events in the left-hand menu. 2. Select the desired event. 4. Click to select the “Send automatic reminder to all registrants” checkbox. 5. Complete the Date and Time fields to indicate when the reminder should be sent. Note: Preview the automatic reminder by clicking the reminder link. The email “look and feel” may be modified with your own custom template if desired. Within the Events module, reports, labels, and downloads are available at the bottom of a number of the lists which may give the desired options right there. These options were explained in the previous sections. Additional reports are available in the Reports module of the software. The flexibility of downloading data also provides opportunity to bring your Guest List into other programs where labels, nametags, or other desired output may be generated. Click Reports in the left-hand menu. Click Events from the list of links. Select the desired report from the list. Complete the selections as desired and click Print Report. A report is available that will list selected details of your desired event(s). After generating this report, you may choose to email that to desired recipients. Click Events in the Reports Categories area. Complete the desired Filter Options and click View/Print List. When the desired events display on the screen, press Ctrl-A (to select all) and then press Ctrl-C (to copy all). You may also click Select All from the Edit menu in place of pressing Ctrl-A. 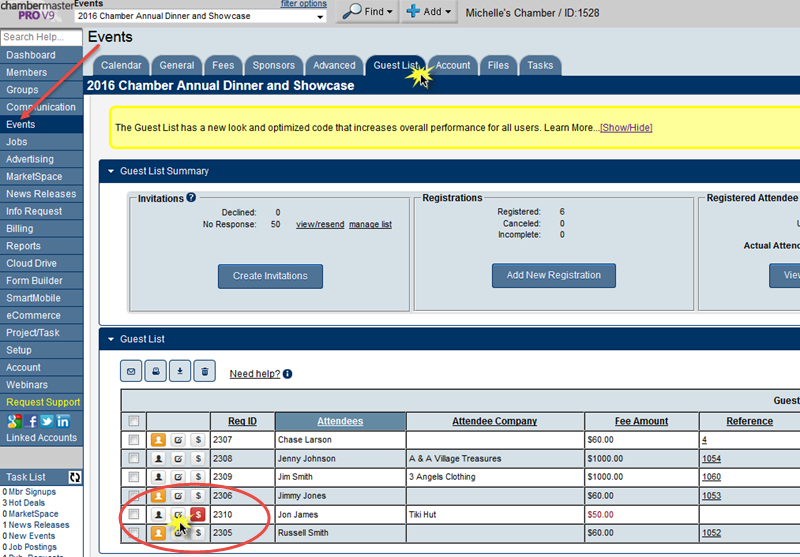 Also, you may click Copy from the Edit menu instead of pressing Ctrl-C.
Click Close to close the event listing window. After completing the above steps, proceed immediately to the next section. Click Communication in the left-hand navigation bar. Click New Email to Multiple Members. 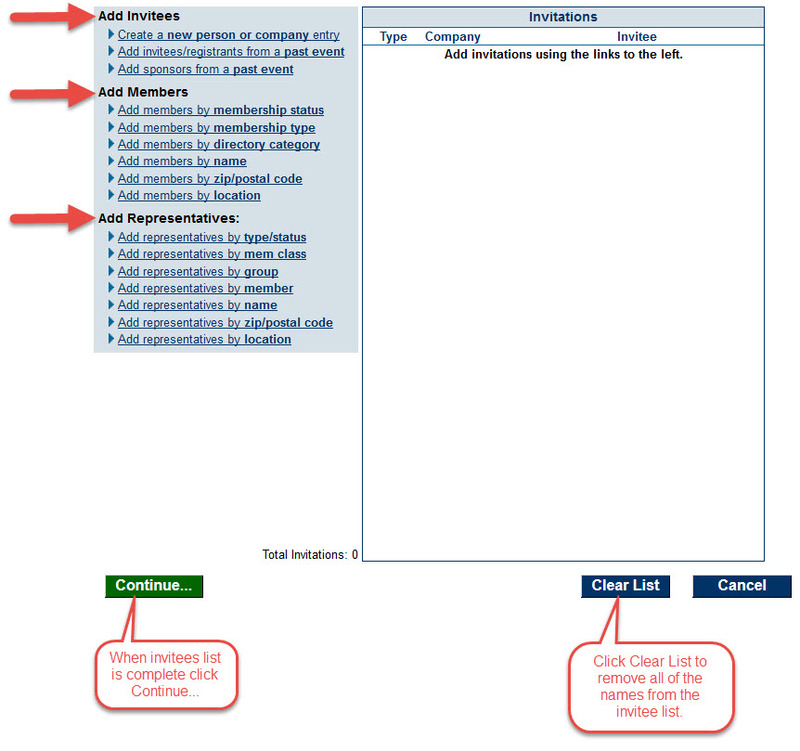 Select the desired addressees (by membership status for all active members) and distribution method (Email only). Complete the From: and Subject: fields. Click in the Body text area. Type any desired opening information. Click Allow Access (if necessary). The events listing from the steps performed above will display in the email. Complete the email and click Send Email. Name tags may be created that will list a participant's name and business name. If you desire additional participant information or to include a graphic on the name tab, you may wish to download the name tag data and import into Microsoft Word where you can customize the name tag as desired. Click Events in the left-hand navigation bar. Select the desired event from the Events drop-down list. In the Guest List section click on the Reports button. 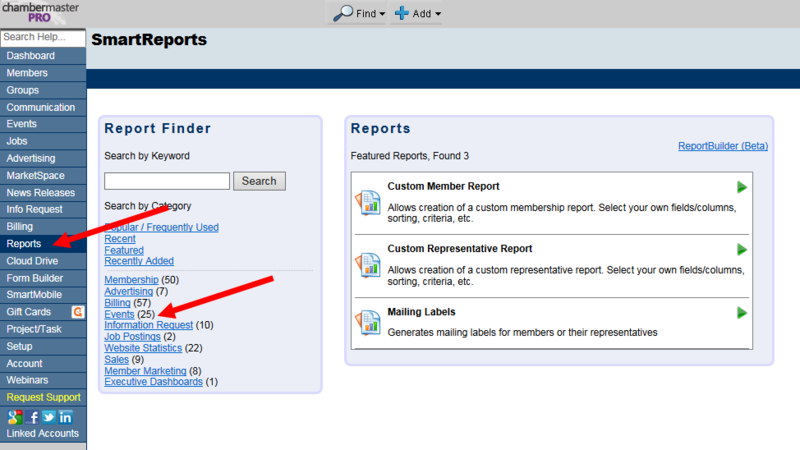 In the Report Items window select Style 3. 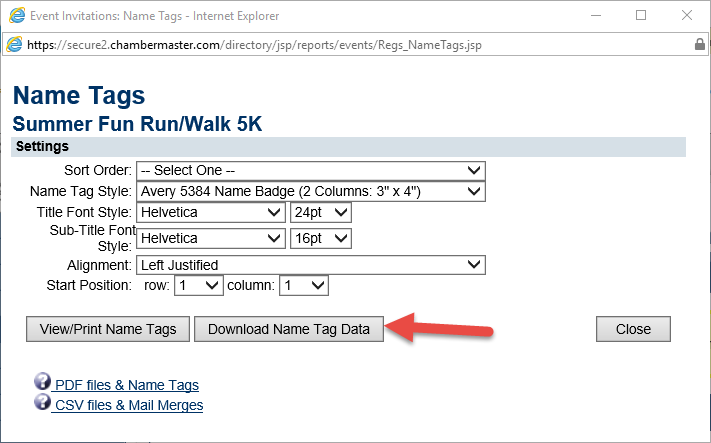 The nametag data will be downloaded to an excel spreadsheet for your future use. Update the Event Title/Description: You may simply wish to add "Cancelled" after the name of the event. It is also a good idea to add some further information in the description. Perhaps you are planning simply to postpone and want to let the public know this. The title and description can be updated on the event's General tab. Turn off on-line registration: To ensure that no additional registrations are received for the event, disable Allow members to register online for this event and Allow non-members to register online for this event in the Registration & Billing Preferences section of the Fees tab. Be sure to Save Preferences. Notify Registrants: Email your registrants as soon as you can, and if possible, give everyone a call. Some folks aren’t always checking their inbox, so be sure to communicate this critical information using all avenues possible (you may also want to consider using social media). Your email should be upbeat, and include details about refunds, future event date, etc. You can easily email all registrants from the Guest List tab. See Send an Email to multiple guests. Turn Off Event Reminder: If you have setup a reminder to automatically be sent to registrants, best practice is to turn off the reminder. The reminder may be turned off on the event's General tab. NOTE: If you have edited the title and the description of the event, these changes would be included in the reminder if you have forgotten to turn off the reminder. If an event has been created by mistake, you may delete the event. NOTE: All history of participants, sponsors, and fees will also be deleted and no longer available in reports. Use this option with caution. If you delete an event in error, and wish GrowthZone to restore the event, fees will be applied. Note: The Delete Event selection is only available to those with Administrator Level permissions. If you are using the Pro Edition, you can easily create a project, or add tasks to your events. On the desired event, click the Tasks tab. See Create a New Project for final instructions on creating the new project. If you are using the Pro Edition of ChamberMaster/MemberZone you can add tasks to an event to make it easy for you to track progress. On the desired event, click theTasks tab. See Adding a Task for final instructions on creating the task. 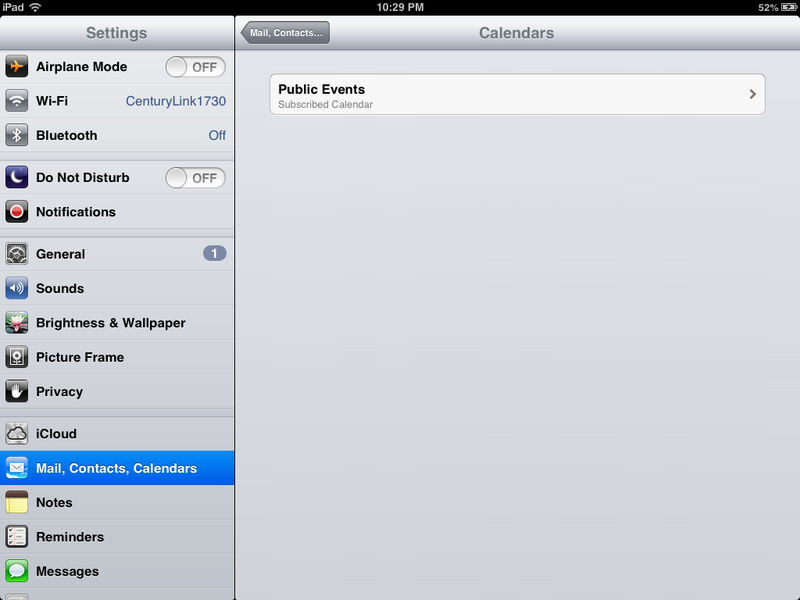 Event calendar feeds automatically synchronize your calendar with your events listed in your software. Many different applications support iCalendar, including Microsoft Outlook 2007 and later (Exchange), Lotus Notes 8.5 and later, Apple Calendar iPhone and iPad), and Google Calendar (Android and Gmail). 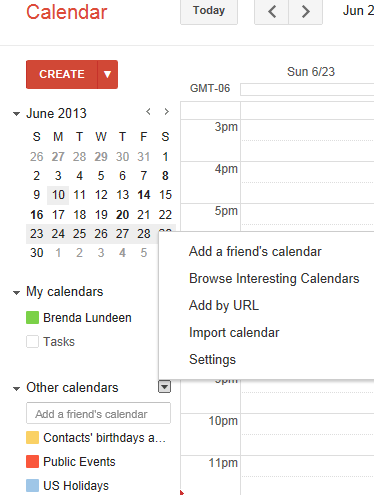 Click Sync with your own calendar hyper-link. 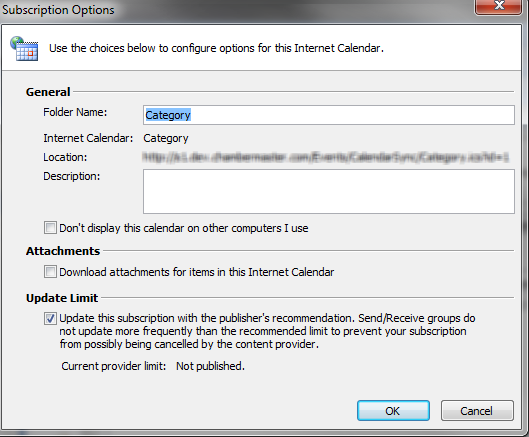 Click the desired link and follow the prompts to synchronize with the default calendar on your system (if available). To synchronize with a different calendar, copy and paste the desired URL into your calendar software in the location where feeds are accepted, often identified with “Subscribe”, “Add Calendar”, etc. Your third party calendar will automatically update every hour with any changes made to your events. The populated date range: today - 365 days from now. Locate the desired event feed. Click File, Date File Management. 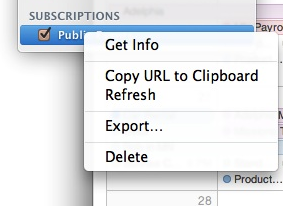 Click OK on the Subscription Options window. Open a browser window and login to your Google Calendar. Click the arrow next to Other calendars. Paste the URL into the URL field and click Add Calendar. When logged into your Google Calendar, click the arrow next to Other calendars. Highlight the URL and copy it. Select the Calendar menu and click Subscribe. After the feed is loaded, you have the option of changing some of the settings if you wish. 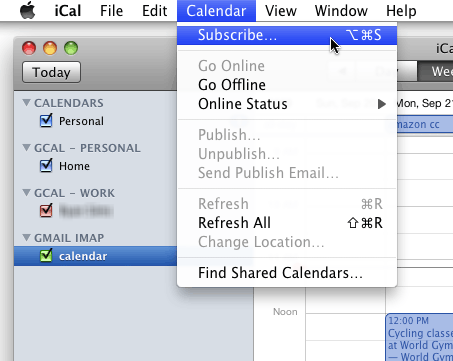 From the Calendars menu, right click (control) the calendar under the Subscriptions section. Click Get Info and set Auto-Refresh to None. Send yourself an email with URL pasted into it. On your iPad or iPhone open that email. Note: you could copy and paste the URL and add it manually under Settings->Mail, Contacts, and Calendars->Add Account->Other->Add Subscribed Calendar. But clicking the link in an email streamlines the task. The feed will load and provide a message. 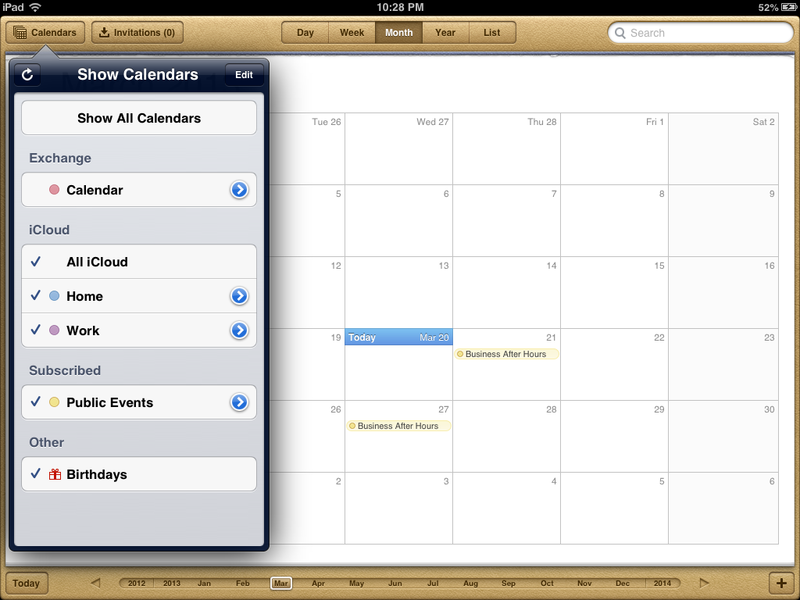 The calendar will appear in your iPad calendar. Can I customize registration instructions and/or confirmation messages for my events? How do I create an event fee item that has limited quantities available? How do I create an event fee item that will automatically register multiple attendees – a table of 8, team of 4, etc.? How do I gather certain information for an event at the time of registration (meal choice, shirt size, seating preference, etc.)? How do I cancel an event registration? Can I edit or add to the event invitation that is created when sending the built-in invitation? Why is my event showing multiple times on the public calendar and I only entered it once? Why does the download of my event guest list include additional columns of items not related to my event? Note: CQI is a legacy product. The procedure that you use to create the event fee depends on whether you have the event fee already created in QuickBooks. For questions related to QuickBooks integration see the QuickBooks section of online help or call GrowthZone support at 1-800-825-9171. Click QuickBooks in the left-hand navigation bar. Click the Event Fees tab. Click Define a New Fee Item. Complete the Fee Item Information screen. If the fee does not exist in QuickBooks yet, click Add Fee Item to QuickBooks Now. 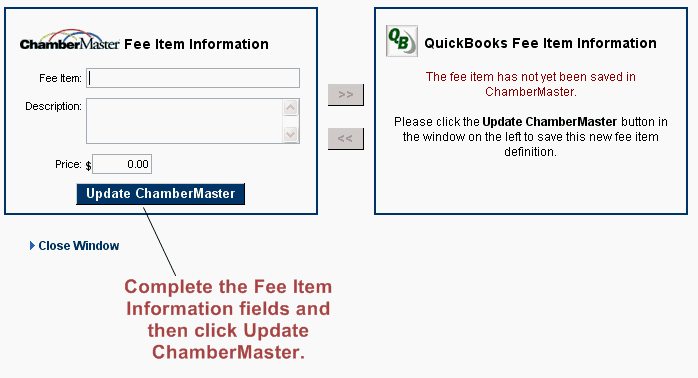 From the list of QuickBooks items and services click the check box in front of the QuickBooks Fee Item that you desire to add to ChamberMaster / GrowthZone. Once matched, you may view a side-by-side comparison of these fees in order to verify or modify description and pricing by clicking the Fee Item Name. Click Find a Match in the row of the desired fee to be matched. From the list of QuickBooks items and services click to select the desired item and service that matches your fee and due. Click to select the check box at the end of the desired item to be deleted.